Recently, a friend of Kristen’s on Facebook posted a GIF that showed the evolution of a desk. In 1980 the desk was covered with items: books, newspapers, magazines; a fax, phone, stapler and tape dispenser; a rolodex, clock, globe, calendar, and bulletin board; and a computer and phone. One by one the items on the desk evolved – and disappeared, becoming an app on the computer – as a scrolling mast of years advanced. By current day, only a computer full of apps and a Smartphone remained on the desk. The GIF represents the possibilities of a digital world. We can, if we choose to do so, conduct our professional and personal lives entirely on, with, and through devices, and a recent Pew study suggests that more and more teenagers and adults are making the choice to go digital. What does this transformation mean? As teachers of reading and writing, we recognize that our own desks – and those of our students – are markedly different than they were even just a decade ago. We accept that, as the National Writing Project asserts, “digital is,” and we wonder how we can help adolescents to become critical readers in a world where they encounter short-, mid-, and long-form texts through their devices on a daily – and even hourly – basis. For us, reading is not an isolating activity. Digital tools allow individual readers to connect to a network of readers; texts of all kinds can be shared quickly and widely. Digital tools also allow readers to share their reading experiences – before, during, and after – with others. In a digital world, reading is visibly social. In our book Connected Reading: Teaching Adolescent Readers in a Digital World, we describe a model of reading that takes into account the networked, social nature of reading today. This model suggests that readers encounter texts in a variety of ways. They may receive them from others, somewhat passively, or they may actively seek out new reading material by surfing without much intention, stumbling through sites with some intention, or searching with focused intention. How do we help students develop their comprehension skills as they encounter and engage with Kindles and Nooks, RSS feeds and Twitter, hypertext fiction and digital textbooks? How do we help them to read critically in a world where information flows constantly? And perhaps most importantly, how do we help them to leverage the possibilities within a network of readers? As we consider these questions, we look forward to the #engchat session on October 5, where we will discuss what it means to be Connected Readers. In the mean time, you might be interested in reading this recent feature article in NCTE’s Council Chronicle: Teaching Teens—and Ourselves—to Be Mindful, Connected Readers. See you Monday on #engchat! Update on 10/27/15: Courtesy of Momchil Filev, the video creator, I have updated the link of the video to the original file available from BestReviews.com. This past week, two thoughtful teachers shared their insight on some of the work I have done with my colleague Kristen Turner. Knowing that what we have written is making a difference in the lives of teachers is, quite simply, amazing. So, I offer my thanks to these two edubloggers here. No surprise here: I agree with Turple completely on the idea that we focus on skills, not tools. Check out the rest of her website for a variety of resources related to TPACK, SAMR, Google Apps for Ed, and more. Second, Jianna Taylor from the Oakland Writing Project (MI) offered a thoughtful review of our book, Connected Reading: Teaching Adolescent Readers in a Digital World — as well as a number of additional ideas and resources that she uses in her own classroom. I very much appreciate the way that Taylor read the book and jumped right in with connected reading practices in her classroom, primarily through the use of Notable PDF. She discusses how this tool is “one of my favorite and most used Chrome extensions both personally and professionally” and the ways that she will use it again this fall. Knowing that teachers like Taylor are willing to jump in and make these changes, turning on a dime, encourages me; often we get caught up in the educational bureaucracy, but she found an idea, tried it, and will refine it to make it better. If, as I often say, “education is the business of hope,” then Taylor makes me very hopeful indeed. So, as I think about the ways in which my work with Kristen continues to circulate, I often reflect on a goal that she and I share when we are writing. As we collaborate, we always have goals in mind. Yes, we write because we enjoy it and because it leads to tenure and promotion within the university. However, there are other more important reasons. 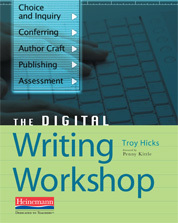 We write about digital literacy so we can better coach our own children as readers and writers. We write to help teachers understand the ways that technology affects literacy practices, and what that means for their students. This week, it feels like the field changed just a little bit more. Thanks, Cris and Jianna for letting us know just how that happened for each of you. 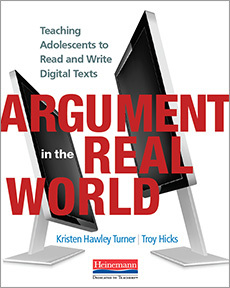 This month marks the publication of my fifth book, a co-authored work with Kristen Hawley Turner entitled Connected Reading: Teaching Adolescent Readers in a Digital World. As readers of all ages increasingly turn to the Internet and a variety of electronic devices for both informational and leisure reading, teachers need to reconsider not just who and what teens read but where and how they read as well. Having ready access to digital tools and texts doesn’t mean that middle and high school students are automatically thoughtful, adept readers. So how can we help adolescents become critical readers in a digital age? 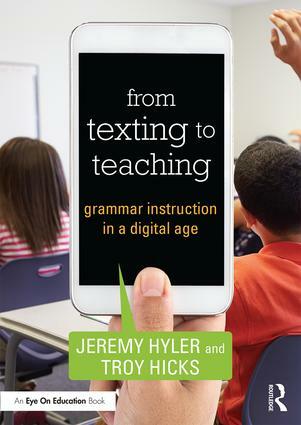 They argue that we must teach adolescents how to read digital texts effectively, not simply expect that teens can read them because they know how to use digital tools. 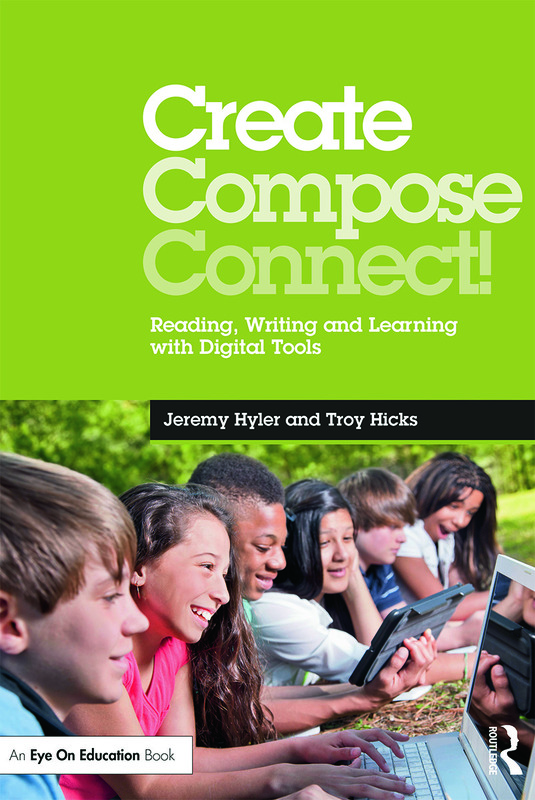 Turner and Hicks offer practical tips by highlighting classroom practices that engage students in reading and thinking with both print and digital texts, thus encouraging reading instruction that reaches all students. We summarize our model in this graphic, and hope that it sparks conversations about the nature of reading in a digital world. Connected Reading: Teaching Adolescent Readers in a Digital World by Kristen Hawley Turner and Troy Hicks © 2015 by the National Council of Teachers of English. This figure may be printed, reproduced, and disseminated (with attribution) without permission from NCTE. Check out the first chapter on NCTE’s website as well as our companion wiki. We look forward to continued conversations about connected reading among teachers, parents, and, of course, our students. 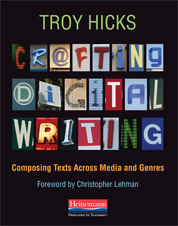 Many thanks to Teri Holbrook for the invitation to talk with her and Franki Sibberson about teaching digital reading and writing in this podcast from NCTE’s Language Arts “Conversation Currents.” The transcript of the interview will appear in the January 2015 issue. I want to thank Matt Renwick and Sara Holbrook for their thoughts as well. It is simply amazing to me how powerful teachers’ voices can be when we reach out and share our thinking. I look forward to doing much more of this over the coming week at NWP and NCTE 2014, as well as on our new Teacher-Writer Network page on FB. Thanks again to all of you for sharing your insights on teaching digital reading and writing. Let’s keep the conversation going. Earlier this evening, I participated in a wonderful closing discussion as part of the sixth and final webinar in KQED’s TeachDoNow series. The archived video as well as a summary of my tweets with links from the conversation are below. Broadly, our conversation centered on this big question: How do you manage learners, tasks, resources, and assessment in a connected learning environment? Having been a listener of BAM Radio for some time, I was happy to be invited to a conversation with Larry Ferlazzo and Alice Barr about effective implementation strategies for 1:1 programs. Also, I was honored to be asked to begin a new podcast series on BAM’s Pulse Network. Designed as a tool to help every educator begin sharing his or her own voice, I wanted to make sure that I was using the new show as an opportunity to talk with teachers, not just at them. Fortunately, around the same time, I was in an email conversation with Katharine Hale, an outstanding young teacher that I met last year at a conference in Rhode Island. We had been talking about various ideas she has for integrating technology into the reading and writing workshop, many of which she shares on her blog: TEaCHitivity. After some trials and errors with the technology (I am reminded that, yes, it is good to fail! 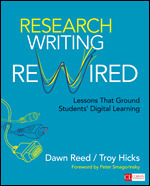 ), we can now share our first two episodes of Revising the Reading and Writing Workshop. In the first episode, Katharine and I discuss some of the shifts that she has seen happening in her instruction this year while working to integrate iPads into her 5th grade classroom. Then, in our second episode, we discuss how Katharine is conceptualizing the idea of “flipped learning” as a crucial component of her reading and writing workshop. Each episode hovers at about the ten minute mark (a specific and intentional technical limitation of the BAM site), so each episode is short and sweet. Here is the RSS feed for the show notes, where I will provide links to the audio for each episode, too. Of course, we are interested in your thoughts and questions, and we will also soon be looking for some guests. Please give them a listen and let us know what you think!